You are here: Home / Lifestyle / Personal Development / Learn magic tricks and find out the TOP 6 ways to BOOST your likeability factor! Learn magic tricks and find out the TOP 6 ways to BOOST your likeability factor! At Encyclopedia of Magic, we’ve been performing magic and helping others learn magic tricks and naturally you learn a thing or two about building rapport with strangers and making them love you (as opposed to the magic itself!). When you learn magic and become a performer, you need to be aware of your likeability factor. Many people feel a natural resentment towards magicians. We are, after all, trying to deceive them, so why shouldn’t they resent that? Being fooled and humiliated isn’t generally a pleasant feeling. So there’s a natural wall between magicians and the spectators. It’s our job to break through that wall and entertain people while we get to know them and give them an opportunity to get acquainted with us. 1. Be aware of your “likeability” factor and understand how important it is. 2. Explore what works for you. 3. Try to be “human” and relatable, remember no one is perfect. You will be surprised with the reception when the audience is on your side. 4. Lighten up! Have fun! Humour always boosts your likeability and charm factor. DON’T try to get a laugh at an expense of a spectator. If you embarrass your volunteer the audience will hate you for it and your likeability factor will plunge to zero. 5. Be natural by being yourself. Be the same person when you perform as you are normally. 6. Assess yourself. How does the audience perceive you? Do they like you? Do they think you are annoying? Try performing for friends and family and get them to rate your ‘likeability’ factor. Or record your act and see for yourself! These lessons DO NOT just apply to magicians. Every moment in your life you are presenting yourself to the world. How do you want to be perceived? Encyclopedia of Magic is a Mawson Lakes based company which uses magic as a vehicle to create positive behavioural change. Magic is a unique skill-set that has the power to change lives, capable of producing amazing reactions and entertainment. However it is also a valuable asset that can greatly benefit the performer themselves. 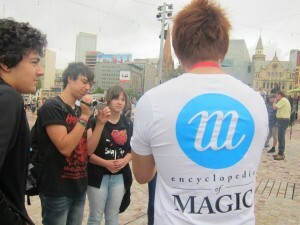 Encyclopedia of Magic are on a mission to improve people’s presentation and public speaking skills, self-confidence, team morale and other important traits through magic. Having already taught magic to thousands of people online world-wide, they are currently holding magic workshops for the general public and also making good traction in the corporate world. Find Lenny on Facebook, LinkedIn, and Twitter.